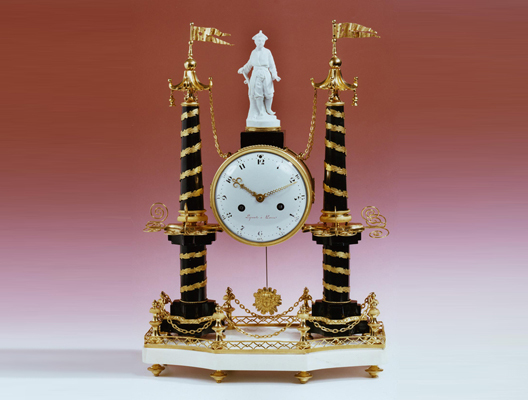 A highly important French Louis XVI period clock of chinoiserie design, the base in white marble, edged by a pierced ormolu gallery, surrounding eight low columns joined by chains. Rising from this base are two large columns of black coloured marble, enveloped in spiralling bands of laurel leaves, each surmounted by a pagoda hung with bells and terminating with a flag at the top. 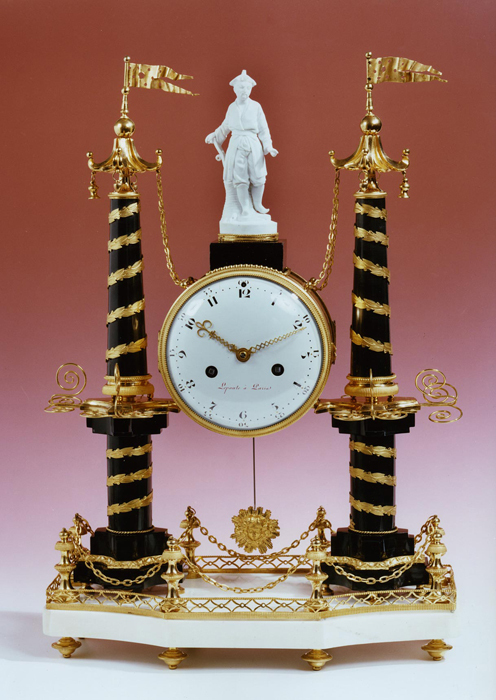 The columns support an important movement signed ‘Lepaute à Paris’, standing on which is the figure of a Chinaman leaning on an anchor made of Locre biscuit porcelain. The pendulum is in the shape of a sun. The clock is in full working order and all the gilding is original. Maximum height 22in (56cm). Width 15 1/8in (38.5cm). Depth 7 1/2in (19cm).